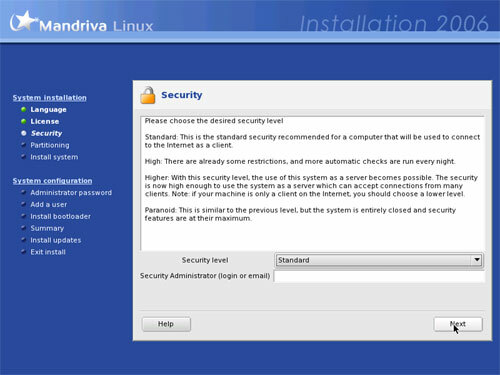 This is a detailed description about the steps to be taken to setup a Mandriva 2006 Free Edition based server that offers all services needed by ISPs and hosters (web server (SSL-capable), mail server (with SMTP-AUTH and TLS! ), DNS server, FTP server, MySQL server, POP3/IMAP, Quota, Firewall, etc.). Download the 3 Mandriva 2006 Free Edition CD iso images from a mirror near you (the list of mirrors can be found here: http://wwwnew.mandriva.com/en/downloads/mirrors), e.g. 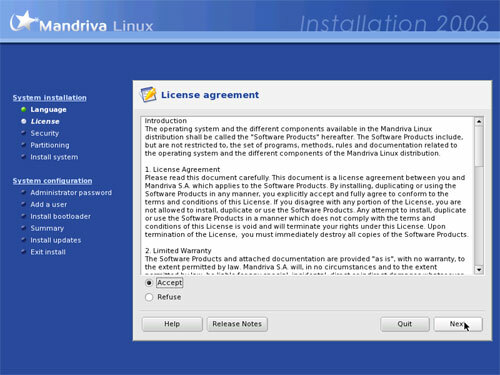 ftp://fr2.rpmfind.net/linux/Mandrakelinux/official/iso/2006.0/i586/Mandriva-Linux-Free-2006-CD1.i586.iso, ftp://fr2.rpmfind.net/linux/Mandrakelinux/official/iso/2006.0/i586/Mandriva-Linux-Free-2006-CD2.i586.iso and ftp://fr2.rpmfind.net/linux/Mandrakelinux/official/iso/2006.0/i586/Mandriva-Linux-Free-2006-CD3.i586.iso. It would be nice to have a version of this howto without all the screenshots of trivial things like the install screens. I like to print these howtos in case I want to use them later. Instead of a couple of pages of useful info, I get 24 pages of screenshots that I''ve already seen when I did the Mandriva install. Maybe some people like it this way, so perhaps you could provide a "concise version" link, like the "printer-friendly version" link. These instructions were quite helpful but I also want instructions on how to set up subversion hosting with mod_dav_svn on Mandriva.